We have a survey which we hope people will fill in – the results will help us provide evidence of our community involvement to the National Heritage Lottery. Please click here to go to the survey – it is not long. 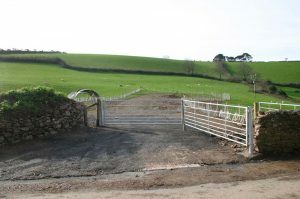 We are delighted to have considerable support from the AONB: www.southdevonaonb.org.uk – who are helping us with our special events this year: a bat walk, bird walk and lots of activities for our Open Day on 21 July – see our Special Events page. After many hours of work on the Heritage Lottery Fund application, we have been awarded the first round grant. As a result, we are now in a position to start setting up procedures to carry out the Heritage Lottery requirements in order to apply for Round Two. As you can see below we now have a sign outside the Church. We also have an Activity Plan Consultant, Christina Dixon and her partner Hilary Bracegirdle, who started work with us on Friday 8 February. However, activities are one of the most important features to develop in order to progress to the Round 2 application with the Heritage Lottery Fund and as a result Christina and Hilary will help us in order to ensure that we fulfil all the necessary aspects of our Activity Plan. In early February interviews took place with three architects and as a result Amanda Le Page Architects were appointed. Soon they will be able to start working on the project. For instance, there will be multiple reports, drawings and plans, again in order to progress to the Round 2 application. Permission to build a car park has now been approved and the car park has been built. See the Car Park page. 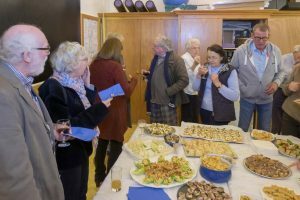 On Friday 22 February we held our Celebration party for the grant. There was a short presentation explaining exactly what this all means to the parish and village. See more photographs. On 23 February Jo Johnston, aged 14, went to the Church with his drone and took amazing photographs of the roof and top of the tower. He also made a video which is on YouTube Drone Video. 4 November 2018 A press release was sent out to various newspapers, Sarah Woolaston, our local MP, and various other organisations – see the press release below. 3 November 2018 Mark sent out an email updating everyone regarding the current situation. 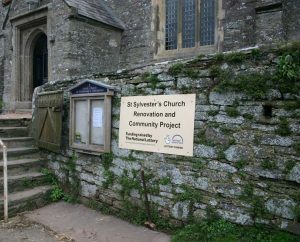 20 September 2018 We received notification that the Heritage Lottery Fund have awarded us a “first round pass” with a development grant of up to £39,300.00 (56% of the total eligible development work cost of £70,327.00) towards developing St Sylvester’s Church renovation and community project to Round 2 submission. 23 May 2018 Our application for a grant from the Heritage Lottery Fund was sent.